Skyway’s Kandy UC has some great features that are causing major disruption in the technology world. Visual Attendant is one of these Now available for enterprises and service providers, it leverages the latest WebRTC technology to boost customer interaction, employee productivity and significantly reduce expenses. Kandy Visual Attendant has been named 2016 WebRTC Product of The Year Award Winner by TMCNet. In its first year, Kandy was powering more than 15 million users and had more than 1,500 customer accounts. According to GENBAND, the predicted number of devices connected will reach 20.8 billion by 2020 which means that the technology world is on the verge of one of its biggest waves of disruption. Visual Attendant is a menu-based, click-to-connect service that integrates into a company’s website without toll-free number fees. It offers end users point and click options to select the right group or department directly from any website without menu prompts. Using the latest WebRTC technology, Visual Attendant connects users whether they have a legacy browser or mobile devices that aren’t WebRTC ready. For more, contact the Skyway Sales team today! 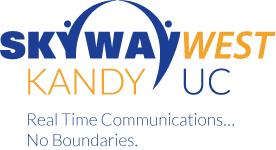 Skyway West partners with Genband to deliver their Kandy UC solution to Canadian business.